There are several ways of producing solar cells and photovoltaic modules. The oldest and most efficient type of photovoltaic cell is made from single-crystalline Silicon. It is called single-crystalline because the atoms form a nearly perfect, regular lattice – if you could see into the cell, it would look exactly the same in almost every spot. In these cells, electrons released during the photovoltaic effect have clear, unobstructed paths on which to travel. Most silicon comes from ordinary sand and several steps are required to turn it into a crystalline solar cell. The silicon must first be separated from the oxygen with which it is chemically bound. Then it must be purified to a point where the material includes less than one non-silicon atom per billion. The advent of large scale photovoltaic production over the last few years (2010 to 2016) has led to development of solar grade silicon with a price tag of $12 to $20 per kilogram. his is expected to decline even further as some very large production plants are completed. The process of growing crystalline silicon begins with a vat of extremely hot, liquid silicon. A “seed” of single-crystal silicon on a long wire is placed inside the vat. Then, over the course of many hours, the liquid silicon is cooled while the seed is slowly rotated and withdrawn. As they cool, silicon atoms inside the vat bond with silicon atoms of the seed. The slower and smoother the process, the more likely the atoms are to bond in the perfect lattice structure. When the wire in fully removed, it holds a crystal about 8 inches in diameter and 3 feet long – the size of long salami. It is cut into wafers, 8/1000 to 10/1000 of an inch thick with a diamond-edge blade and much of the silicon crystal, now worth hundreds of dollars per kilogram, is turned into dust in the process. The wafers are polished, processed into cells, and mounted in modules. More than a hundred industry and university research teams have worked to upgrade and automate the manufacture of crystalline silicon solar cells. They try to further reduce the cost of purified silicon, to develop high-speed crystal pullers and wafer-slicing techniques, and to improve the overall design of modules. There are two or three major steps in producing solar cells from silicon wafers. The photovoltaic effect is produced by forming a P-N junction <need link here> on the surface. Some of the higher efficiency solar cells add a third layer of semiconductor, and then a system of contacts are need to provide electrical connections while allowing sunlight to pass through, generally called a grid. One of the main objectives of PV research, however, has been to increase the efficiency with which photovoltaic modules convert sunlight into electricity. Commercial solar modules typically turn 15 to 22 percent of the sunlight that strikes them into electricity. In the laboratory, module efficiencies of more than 30 percent have been achieved. NOTE: Photovoltaic conversion efficiency is generally based on module output rather than cell output. Modules include many connections and tiny wires in which electricity is lost, and space between the solar cells. Consequently, modules have lower efficiencies than individual cells. Polycrystalline photovoltaic cells are exactly what the name implies – a patchwork quilt of single-crystalline silicon molecules. Connections between these molecules are random and do not form a perfect lattice structure. Polycrystalline cells are less efficient than single-crystalline cells because released electrons cannot follow clear paths. These cells are produced by pouring hot, liquid silicon into square molds or casts. The silicon is cooled to form solid blocks, which are sliced like single-crystalline silicon. These cells are less expensive to produce than single-crystalline cells because their manufacturing process does not require many careful hours of cooling and rotating silicon material. The main challenge of polycrystalline cells is attaining a sufficiently high efficiency. Typically, the boundaries between crystals impede the flow of electrons, resulting in module efficiencies of only 12 to 18 percent. Concentrator cells employ lenses and mirrors to focus the sun’s light onto a high-efficiency, single-crystalline cell. Concentrators help gather sunlight so that a smaller-than-normal cell can produce the same amount of electricity as a standard module. Efficiencies range from 20 to 25 percent with efficiencies as high as 34 percent for a single cell. Although they use less of the costly photovoltaic material, other elements increase their cost. Concentrator cells use more expensive materials and processes since they are a small proportion of the system cost. Because of their lenses and mirrors, for example, concentrator cells must aim directly at the sun. A tracking system is crucial for effective operation. In the past decade, much progress has been made in developing and refining thin-film photographic cells. These cells are created by depositing hot, liquid silicon or other semi-conductor materials onto glass, metal or plastic. 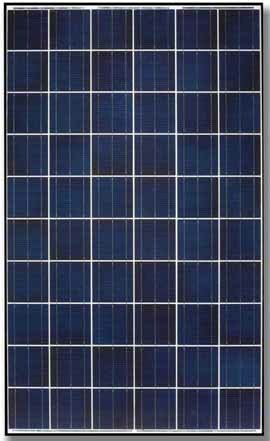 Separate cells are not generally produced, the process forms photovoltaic modules with the solar cells interconnected. One thin-film technology, which is already employed in many PV modules, is called “amorphous silicon”. It is composed or randomly arranged atoms, forming a dense, non-crystalline material resembling glass. The silicon layer is less than a millionth of a meter (a micron) thick requiring considerably less pure silicon then other cell types. Researchers are working to obtain higher efficiency from this material, which lacks the ordered structure and inherent photovoltaic properties of crystalline silicon. Today’s commercial efficiency average 5 to 6 percent but efficiencies as high as 14.5 percent have been exhibited in laboratories. These cells are still in the developmental stage but offer great potential for the future of photovoltaics. Tandem, or multiple-junction cells, are actually several cells stacked on top of each other. Each cell layer is able to convert a different wavelength, or color, of the light spectrum into electricity. Tandem cells have displayed efficiencies higher than 25 percent in the laboratory and theorist predict efficiencies as 35 to 40 percent.